Fact: In work, life and love, we fail. We would rather that failure wasn’t part of life’s complex strategy, but we do fail nevertheless, repeatedly. And some more spectacularly than others. The key is to accept that the hard work wasn’t in vain and have the courage and stamina to keep going and to move on to bigger and better things. After all if we haven’t experienced failure, how can we know what success feels like? Did you know: 90% of all startups fail? And some of the most successful entrepreneurs and organizations, were once on the rocky road to failure? Think Bill Gates, Steve Jobs, Fedex, Evernote, Airbnb and Kentucky Fried Chicken. So what changed their ‘luck’ around? Firstly, there is no correlation between luck and success. As Richard Branson suggests, success stems from hard work and from those who are willing to take risks. That means, picking yourself up from failure and trying again until you succeed. Through Jurgen Appelo’s Management 3.0 exercise, Celebration Grids, we learn that it is important to celebrate both success and failure. That as long as we are learning all the time, we are on the right path to success. The key is not to keep making the same mistakes over again. We have to put aside our fear of failing and get on with success. We have to learn to accept rejection and not let it crush our hopes and dreams. And seriously, wouldn’t life be pretty mundane if we didn’t take chances and accept failure as part of life’s learning process? Many of our Happy Melly team are entrepreneurs and business owners in our own right. We collaborate on Happy Melly because we believe that the future of work rests on creating happier workplaces. And we want to be part of that change. On the flip side, we’re each going through that helter skelter startup ride. If you’ve ever started a business, you’ll know the feeling: one day you’re invincible, the next day you’re not good enough and want to give up. 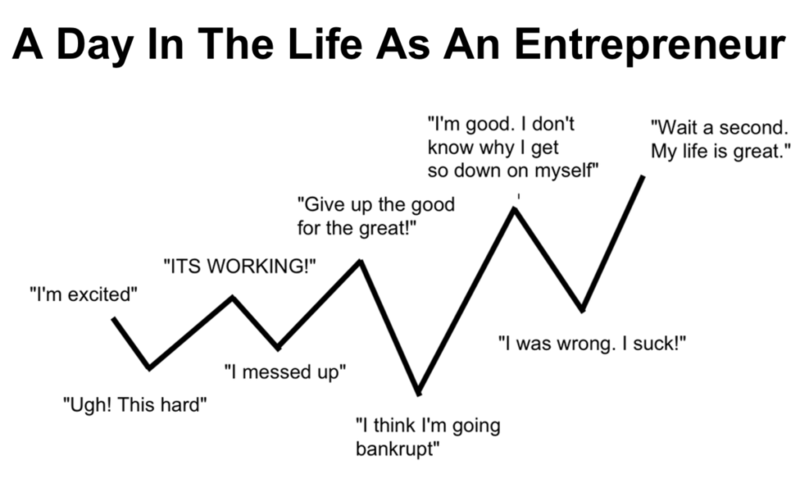 Seriously, what entrepreneur can’t relate to this graphic? Each of us is learning that it’s okay to fail (believe me I’ve failed enough times). We’re just building a resilience to knock backs and learning how to get up and try again and do things better. Life should NEVER end in failure. Understand where you went wrong: Identify the cause and restructure your model accordingly. Experiment: Don’t be afraid to experiment and try new ways of working. Or innovate new products and services. Shed the fear: Once you’ve failed once, twice or thrice, you’ll learn there is nothing to fear. The only way is up! Attitude counts: Be accountable for your failure. Don’t lay the blame on someone else’s doorstep. You can only move forward once you have accepted your mistake. So with all this in mind, when we received an email from the fab team at Online MBA Today who wanted to share their awesome Success and Failure infographic we were thrilled! Who wouldn’t be inspired to keep going, when we learn how some of the world’s greatest business successes, once licked the wounds of failure. Enjoy and keep on doing what you’re doing! One thought on "#Infographic: There’s no success without failure"
Great post, especially true that failure is something to be embraced and learnt from!